When I first heard about this movie I thought it's gonna be another The Social Network movie about nerds becoming billionaires. Instead, this movie is about a "secret government project" was used into solving crimes like terrorism. 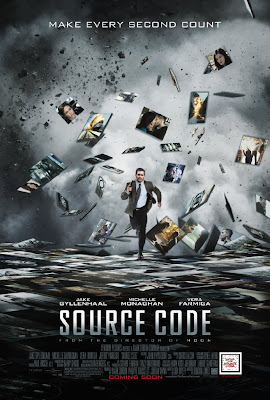 The "source code" brings back the "user" in the final eight minutes of a recently deceased individual. More like a Minority Report but instead of going into the future, the program let you return to the past to investigate the unsolved crime. With that premise, this movie caught my attention. To be honest, if you haven't learn the premise of the story, you will be confused on the earlier part of the film. But as the story progressed, the "source code" was explained. This approach made the movie a lot more interesting and it lets you get hooked with the story. The story, as most sci-fi movies out there, have plot holes all over it. A lot of debates spawned over the interwebs and I was amazed that a lot of netizens were defending this movie. What that in mind, this movie had acquired a fan base of its own. As for me, I'm just thinking that this is Hollywood, and in Hollywood, plot holes really do appear because the main objective of the movie is to entertain the viewer (Michael Bay films anyone?). I was happy that the cast of characters were really developed through out the film, well given the fact that the train scene was recreated over and over again. But at least they gave justice to each character, even the minor ones. The music though needs more to be desired. The film was lacking music that might boost the emotions in the movie, much like the background music from Inception. But this minor hiccup can be forgiven. Overall, this movie is a keeper for some sci-fi movie buffs like me and I recommend you watch it with a love one or with your buddies.